An active natrocarbonatite volcano that is situated at the base of the Gregorian rift in Tanzania, East Africa. This volcano can be hiked in around 12 hours and is one of the most challenging hikes (if not the most challenging) hikes in Tanzania. An awesome adventure for the right sort of person! 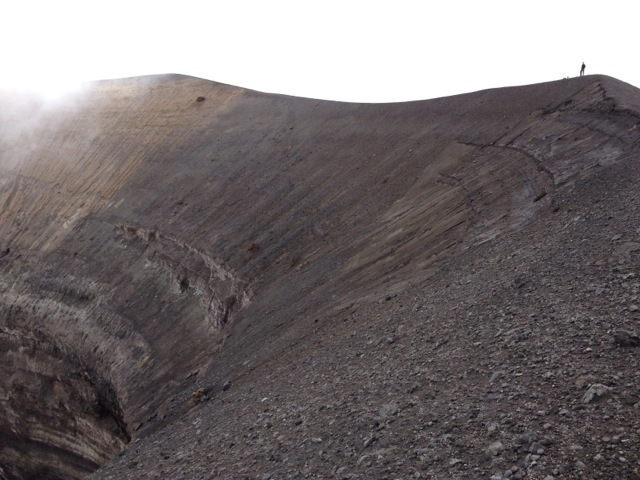 Prior to the 2007 eruptions that continued into August 2008, this was always a tough climb but now made tougher by the lack of vegetation and even looser ash under foot and precarious final ascent to the rim. On this trip we had a very strong group of 6 guests (2 of us had been up multiple times) and it still took 12 hours up and down. Relentless uphill. Loose underfoot. Frustrating. And then as dawn starts to spread her feathery fingers across the night sky, well you’re in for the experience of a lifetime. Dramatic views akin to flying, rich golden, greens, blacks and grey colours rioting in the dawn. 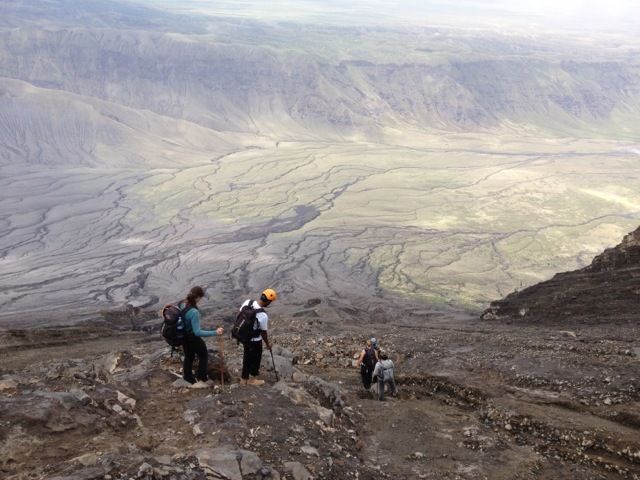 A steepness and challenge to excite even the most hardy and then at the top peering into the heart of an active unique volcano in the rift valley. Oh, and on a good day you can also see all the other volcanoes from Kilimanjaro to the hundreds nearby and even the Serengeti short grass plains. Getting down takes as long as getting up and by the end if you are not utterly exhausted there is a chance you are not human. Water: you will use a lot of water. Going up is extremely strenuous, your body burns through a huge amount and coming down once it gets hot you loose and use similarly large amounts. Carry around 5 liters and you can leave some at the half way point (your guide should know this point and hide your bottles if there are lots of people hiking up!). Oral rehydration sachets highly recommended (at least 1 per person). Make sure your guide had some water & snacks, ours did not have enough and he suffered. Food: take plenty of snacks, my preference is a mixed of protein bars, biltong, M&M’s and biscuits. Lovely to have a thermos of tea pre mixed if you have the energy to carry it J. Keep snacking and drinking on the way up and down for optimal performance and recovery. Clothing: head torch, wear hiking pants, take a fleece and a waterproof jacket, beanie, sun hat, sunglasses, sunscreen, CLIMBING HELMET – ask your tour operator / event organiser, friends but this is really a must – we had helmets and one of our group did have fist sized rocks hit is head dislodged by accident by other members of the group and the rocks accelerate to a dangerous pace in a short distance due to the steepness. You will be hot starting out and chilly at the top, the wind at the top will draw away heat (and hence waterproof jacket important to cut out wind chill). If it is raining don’t do it. I’ve hiked this mountain multiple times in the rain and it really is no fun at all and pointless given there is the amazing Ngare Sero gorge, waterfalls and source, rift valley hikes and more in the event the weather is bad. In fact, for most people that are not into extreme adventure I would always advise alternative activities in the area. All visits to the Lake Natron area require checking in the with the CBO (Community Based Organisation) in Ngare Sero. They arrange guides (currently with working radios). You will need your own / tour operator transport to get to the base for a midnight start. Generally it is a good for safety reasons to keep the car at the base with additional water, snacks, first aid with a driver / guard in the event of emergencies. It takes around 40 minutes to reach the base from Ngare Sero village camps / lodges. 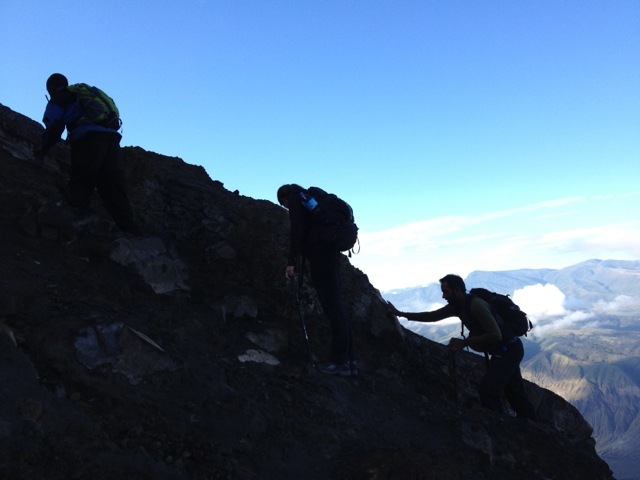 Climbing without a guide is not allowed nor recommended as the route does change and is potentially dangerous. If organising through a tour operator then our advice is that it is helpful to have a proper mountain guide along (and of course with Summits Africa we always do this) for safety and additional information. Direct from Arusha you can drive 3 ways and all routes take approximately 5 to 6 hours. When the road is freshly graded it can take 4 to 5 hours. All routes very dusty once off the tarmac road. You need to drive to Ngare Sero village to attempt Lengai and all camps & campsites are located in this village. Mto Wa Mbu route: from Arusha head towards Mto Wa Mbu and just before the village take the right turn towards Engaruka. You will pass Silela village and Engaruka (and some small villages) on route. The road once you turn right near Mto Wa Mbu is dirt. Monduli Juu Route: from Arusha drive to Monduli Juu – turn right just after Meserani before the army camp and head up and over the western slopes of Monduli, down onto the depression before Kitumbeini and join the Longido road to the East of Kitumbeini (there is another to road to the west, very broken at the time of writing. Longido route: head out on the Nairobi road and once past Longido there is a left turn that takes you towards Kitumbeini and then over to Gelai and joins the main road from Mto Wa Mbu near Lengai. On safari you can reach the area (Lake Natron / Ngare Sero) in others ways as part of an itinerary. From the Ngorongoro highlands you can do a 2 – 7 day walking safari from various parts of the highlands and end at Ngare Sero (the village where climbs are based from). There are at least 3 routes from Empakai crater that I know and probably many more to find. The shortest is to hike from Ngare Naiobi to the base of Lengai and get picked up and drive to Ngare Sero. There are some longer routes from Ngare Nairobi that are more off the beaten track and arrive directly into Ngare Sero (we just did a first descent on mountain bikes on one route – can only recommend for the extremely adventurous!!). From the Serengeti you can drive from Klein’s Gate to Ngare Sero (around 5 hours depending on road conditions), or even from southern Serengeti via the Gol mountains, Olkarien / Sanjan gorge to Malambo and then to Ngare Sero. NOTE the 17 corners route is very badly eroded, not passable at the time of writing so always head via Malambo and join the main road to Loliondo. The best combinations that I can recommend here are a Empakai – Natron walk, 2 nights in the area with a gorge walk and ascent for the very active and then return to Arusha. A great alternative we can organise is coming from Klein’s, biking to Natron and or hiking through Gol and ending in Natron (before heading back to Arusha). NOTE: drive distances are long and tiring. They have a fee structure currently of $100 up to 3 people, another $100 thereafter which is essentially 1 guide to 3 people rate. There are additional fees to visit other attractions but these days they seem to have sorted out this to make it easier such that $20 covers all attractions and includes a local guide. Given that they have this organised structure in place now I do recommend that people take advantage of it and give critical feedback to help them improve. Also note coming or going on the Mto Wa Mbu route incurs fees at Engaruka ($10 per person), Longido ($10 per person) and Ngare Sero / Natron ($15 per person). These gate fees were supposed to be removed but at the time of writing (Dec 2012) they were still there. RESIDENTS should be paying less and I paid $5 at the Natron gate and nothing at the others. TAKE YOUR RESIDENCE PERMIT and for best results remain calm and polite. Rift valley hikes: some great loops up the rift and around – very active and adventurous and a great alternative to Lengai if Lengai is cloudy / wet. Full day. Homonid footprints: see some footprints set in the ash near Ngare Sero’s Lake Natron camp and combine this with seeing the flamingos. Flamingoes: walking down by Lake Natron is actually very pretty, especially for sundowners with pretty light and stunning views. The best flamingo viewing seems to be around October / November when they are breeding but I would not advise going too close, they get agitated and continually doing this can’t be good for their feeding and or breeding. There are lots of other waders here, it’s a great bird spot (RAMSAR / IBA in fact and the most significant and important site for Lesser Flamingo breeding). Historically Kamakia’s campsite on the river was the place to go but these days it has fallen into disrepair and was not being used at the time of writing. There is a small lodge build on top of the hill behind Kamakia’s – rather terrible placement as it can be see from almost everywhere, which is a bit of an eyesore, and a shame really as the real beauty of this area is the wilderness and rawness of the habitat. Other options include at least 4 other campsites closer to the village and Moivaro’s Lake Natron Tented camp that also has good camping grounds too (camping $10 per person a night). For something a little different try the very eco friendly Lake Natron Tented camp by Ngare Sero (not be confused by the Moivaro propery) which is closer to the lake and camouflaged by cargo netting. Definitely more expensive than the other offerings but away from the other camps and laudable ecologically sensitive camp. 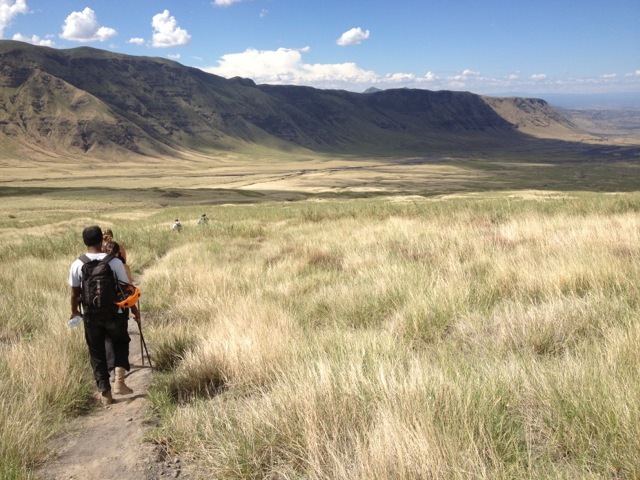 This entry was posted in Lengai and tagged empakai, lake Natron, lake natron camp, lengai, natron, ngare naiobi, ngare sero, waterfalls hike by summitsafrica. Bookmark the permalink.